Based on Book of Esther. Popular name of a collection of tales written in Arabic under the title "Alf Lailat wa Lailah" (One Thousand and One Nights), and rendered familiar to all Europe by Galland's French adaptation of 1703-1717. The constituentelements of the collection vary in different editions; Burton's edition, which is the completest, contains more than 230 stories, many of which include other stories, making the total not far short of 400. Joseph Jacobs, in an introduction to a reprint of Lane's edition (London, 1896), suggested that these stories may be divided into four successive strata: (1) a Persic-Indian nucleus consisting of Indian tales translated into Pahlavi at the same time as similar collections of tales—Barlaam and Bidpai and Sindbad—was adapted during the reign of Chosroes I. (531-79); this is set in a framework of local Persian origin; (2) an Arabic adaptation made at the court of Harun-al-Rashid in the ninth century, under the patronage of the Barmecides, by Abu Abdallah Mohammed al-Jahshiyari; (3) additions made in Cairo between the twelfth century and the fifteenth, and final redaction there which gave the whole collection an Egyptian tone; (4) additions found only in Galland's translation, including "Ali Baba," "Aladdin," and "Prince AḦmad," which have been traced to the recital of a native Christian of Aleppo, named Hanna, who visited Paris in 1709. The Jewish interest in the "Arabian Nights" connects itself with the first and third of these sections. De Goeje has suggested that the framework story of the whole collection, in which the queen Shahrazad averts execution by telling tales for one thousand and one nights, is the same story as that of the Biblical book of Esther. Shahrazad, in the Persian tradition, is the mother-in-law of Ahasuerus, who in the Biblical story also beguiles his nights by having tales read to him; his wives also hold office only for one night, until Esther obtains a more secure tenure. M. de Goeje thinks that the "Arabian Nights" preserves a more original form of the story, as the writer of the Bible narrative has modified the fate of Esther's co-wives. F. Perles, in a series of papers contributed to "Monatsschrift" (xxii. ), has pointed out that several of the stories of the "Arabian Nights"—mainly those taken from the Cairene additions—deal with Jewish topics or are derived from Jewish sources. 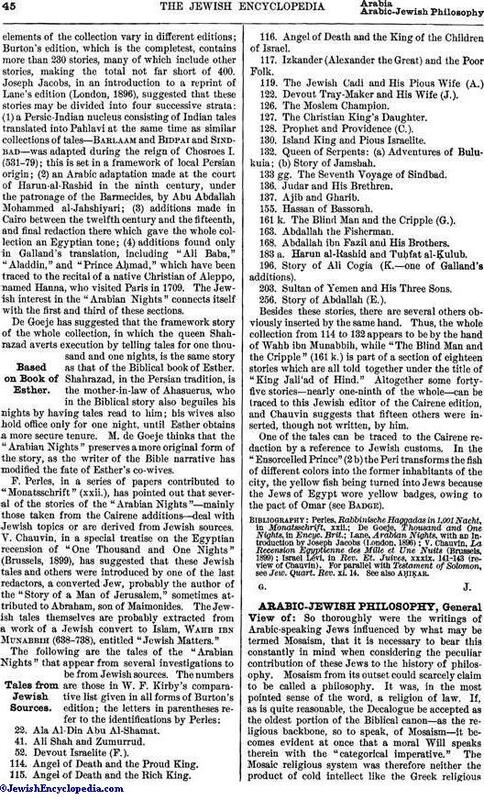 V. Chauvin, in a special treatise on the Egyptian recension of "One Thousand and One Nights" (Brussels, 1899), has suggested that these Jewish tales and others were introduced by one of the last redactors, a converted Jew, probably the author of the "Story of a Man of Jerusalem," sometimes attributed to Abraham, son of Maimonides. 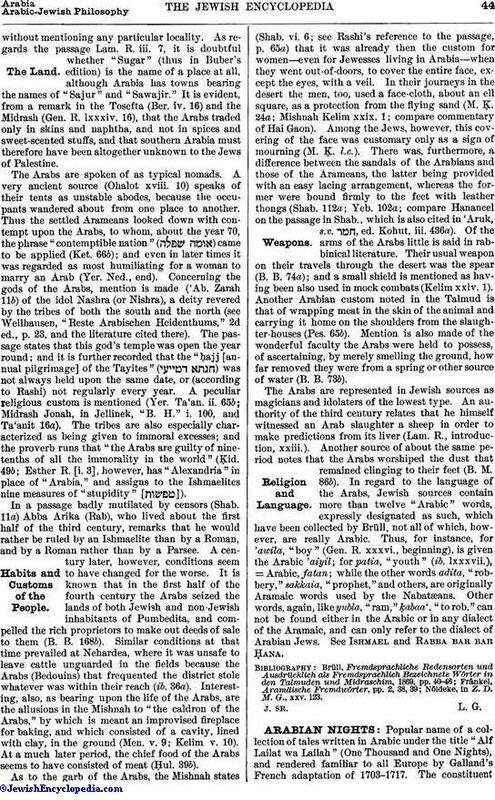 The Jew-ish tales themselves are probably extracted from a work of a Jewish convert to Islam, Wahb ibn Munabbih (638-738), entitled "Jewish Matters." 22. Ala Al-Din Abu Al-Shamat. 41. Ali Shah and Zumurrud. 114. Angel of Death and the Proud King. 115. Angel of Death and the Rich King. 116. Angel of Death and the King of the Children of Israel. 117. Izkander (Alexander the Great) and the Poor Folk. 122. Devout Tray-Maker and His Wife (J.). 127. The Christian King's Daughter. 128. Prophet and Providence (C.). 130. Island King and Pious Israelite. 132. Queen of Serpents: (a) Adventures of Bulukuia; (b) Story of Jamshah. 133 gg. The Seventh Voyage of Sindbad. 136. Judar and His Brethren. 161 k. The Blind Man and the Cripple (G.). 168. Abdallah ibn Fazil and His Brothers. 183 a. Harun al-Rashid and TuḦfat al-Ḳulub. 196. Story of Ali Cogia (K.—one of Galland's additions). 203. Sultan of Yemen and His Three Sons. 256. Story of Abdallah (E.). Besides these stories, there are several others obviously inserted by the same hand. Thus, the whole collection from 114 to 132 appears to be by the hand of Wahb ibn Munabbih, while "The Blind Man and the Cripple" (161 k.) is part of a section of eighteen stories which are all told together under the title of "King Jali'ad of Hind." Altogether some fortyfive stories—nearly one-ninth of the whole—can be traced to this Jewish editor of the Cairene edition, and Chauvin suggests that fifteen others were inserted, though not written, by him. One of the tales can be traced to the Cairene redaction by a reference to Jewish customs. In the "Ensorcelled Prince" (2 b) the Peri transforms the fish of different colors into the former inhabitants of the city, the yellow fish being turned into Jews because the Jews of Egypt wore yellow badges, owing to the pact of Omar (see Badge). Israel Lévi, in Rev. Et. Juives, xxxix. 141-143 (review of Chauvin). For parallel with Testament of Solomon, see Jew. Quart. Rev. xi. 14.